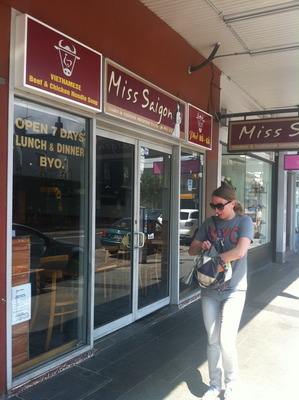 A quality Vietnamese Restaurant called Miss Saigon lives in Darling Street, Balmain. Well designed decor, and a quality and inviting establishment. A word of warning: do not waste your time eating out at this establishment unless you are in the mood for Asian food. This isn't meant to be a simple, cheap eatery. The prices are fairly reasonable, however the food is really something. Their pho is great, and any of their dishes with prawn, not to mention their salt and pepper squids are just well cooked. They (the salt and pepper squids) are very hot, so ensure you have plenty of water nearby if your spice thermostat is usually at an all time low. Also for entree, their spring rolls are tasty and crispy. Really simple. A simple experience, but not the dumbed down variety. A great restaurant to catch up with a friend you haven't seen for a while (and yes you both have to be in the mood for Asian food, otherwise grab some take away instead) and great to go on dates here too. Simple food, well presented with fairly good service. Don't know why but the staff are a little bit funny with credit card payments, so keep things simple and pay cash, and a small tip is always appreciated here. Otherwise a great, quality establishment in Sydney. Why? For quality Vietnamese food in a simple setting.